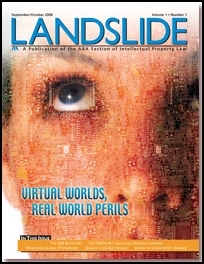 I’m excited to report that I co-authored the cover article, Virtual Worlds, Real World Issues, for the the inaugural issue of Landslide. Landslide is a new magazine from the Intellectual Property Law Section of the American Bar Association; it should be arriving in mailboxes this week. My co-author is Sean Kane, who is also one of my co-chairs on the Virtual Worlds and Multiuser Online Games Committee of the ABA’s Science and Technology Law Section. If you’re a member of the IP Section, you’re automatically subscribed as a membership benefit. If not, the IP Section has put the article, Virtual Worlds, Real World Issues, By Sean F. Kane and Benjamin Duranske (.pdf) online. The article is a big-picture introduction to virtual law, and should be a good jumping-off point for anyone interested in this emerging field. Thanks to readers who have sent congratulations, and welcome to new readers visiting for the first time.